With Alexa, device makers can build compelling voice-forward products for the smart home that offers a natural user interface. You can create delightful experiences with lights, switches, thermostats, cameras, door locks, and many more device types. You have the flexibility to either connect your devices to Alexa, enabling customers to control them from Alexa devices, or create a fully integrated Alexa experience into your devices, enabling customers to talk to them directly. Your smart home devices will continue to become smarter with Alexa’s native smart home voice user interface, features such as Alexa Routines and Groups, and more. Build Alexa into your smart home device with a microphone array, provide a hands-free Alexa voice experience, and enable your products to play music, books, dialog, and more. Connect your smart home devices to Alexa by building an Alexa skill, enabling your customers to control them from tens of millions of Alexa devices. With the vision of a helpful home that listens and responds to every voice command, ecobee is leading the way into a Whole Home Voice future by bringing far-field voice technology and Alexa into every room. As an early believer in Alexa and the power of voice, ecobee developed smart home skills to enable voice control for their ecobee3 thermostat using an Echo or Dot. 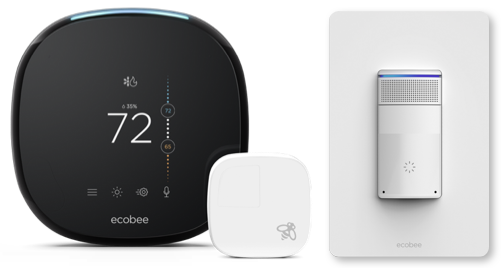 Then, to provide a more seamless and integrated customer experience, ecobee made the strategic decision to integrate the Alexa Voice Service into the ecobee4 thermostat and Switch+ light switch making them stand-alone Alexa built-in devices. ecobee is able to differentiate their products by providing built-in voice experiences, complemented by Smart Home skills tailored for specific use cases (e.g. “Alexa, set Downstairs temperature to 72”). In order to deliver the best hands-free voice experience, ecobee experimented with everything from microphone placement, the optimal number of mics, and different audio algorithms. For example, given the form factor of the ecobee4 smart thermostat, a 7-mic solution was impractical. Having access to the Conexant 2-Mic Development Kit enabled them to quickly prototype and verify the efficiency of a 2-mic solution. They applied modifications to the algorithms that run on this kit and integrated it with the Amazon Wake Word Engine to achieve even better far-field performance. ecobee developed the ecobee4 and Switch+ products before the AVS Device SDK existed. They built and maintained custom Alexa client code and revised it to add new capabilities. To make device maintenance and updates more efficient, ecobee is now moving to the AVS Device SDK. As AVS adds new features and provides updates to the SDK, ecobee will be able to make them available to their customers quickly. Finally, the first ecobee customers had to enable skills and perform account linking manually. To provide a more delightful setup experience, ecobee is implementing Partner Centric Onboarding (PCO), a new AVS feature which will enable these skills automatically and reduce friction for customers. The AVS Device SDK makes it easy for commercial device makers to leverage the AVS APIs and build clients that handle core Alexa functionality. Complement the Alexa built-in experience on your device with connected experiences from another Alexa device or the Alexa app using Smart Home Skills. Amazon works with select Systems Integrators (SIs) and Original Design Manufacturers (ODMs) to help commercial device manufacturers bring new devices with Alexa built-in to market. ODMs such as Calix, Gemtek, and Adition offer smart home solutions. These Program Requirements are part of the Amazon Developer Services Agreement. You must ensure that you and all of your AVS Products and AVS Components (if applicable) comply with these Program Requirements at all times.